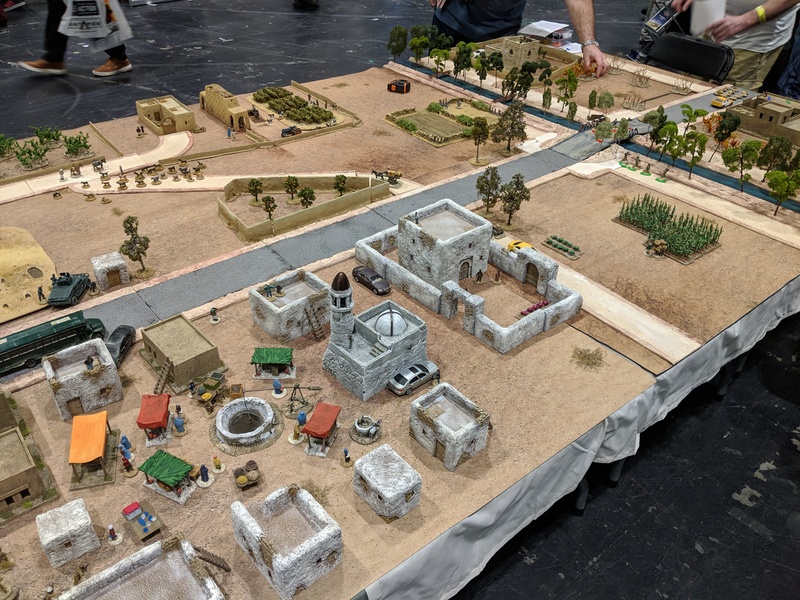 Last weekend was Salute 2019, the biggest wargames show of the UK calendar. And as is tradition, I got myself down to London for a weekend of tourism and looking at the usual impressive selection of wargames goods that appear at the show. And, as you can see in the last Wargaming Week, I bought a few things from the usual suspects. After having pre-ordered the important stuff that I knew would probably run out, I decided to take a more leisurely start to the day at Salute. As someone who isn’t a huge fan of playing demo games at shows (I prefer my wargaming slightly slower paced and without being concerned at making sure I’m not missing something else) I usually burn through everything by lunch. So rather than waiting in the queue for the mad crush, I decided to casually stroll in later on. In a turn of events that will shock exactly no one, my first stop was to the Spectre Miniatures who this year were right inside the door. After picking up my order and marvelling how quick the vultures had picked it clean of all the new stuff, I had a look at their demo game you can see above. Using the Black Site Studios buildings on a battle mat, they had a cool scenario with Russian agents trying to reclaim a cold war weapons cache clashing with US operatives. Overall, it seemed busy all day. A quick drop in to Studio Miniatures was next and it was for exactly this picture. I’m still incredibly proud of the work we did on Plausible Deniability and seeing it available at Salute was a very strange thrill. Another quick drop in was to see Supreme Littleness Designs, my local MDF wizard. More importantly, I wanted to see this little beauty he had talked to me about – a colonial fort. I can see it appearing in an upcoming game or two so watch this space. And then I got to the White Dragon Miniatures stall and my wallet suddenly became lighter. First up, their new Taliban figures looks exceptional. I have a pile of them on my desk at home and I can’t wait to get them painted up. Of course, it wouldn’t be a show without some previews and White Dragon brought along a future range – the IDF! Complete with both Tavor armed infantry and two versions of the Merkhava, I can’t wait to see more of them! Finally I got to take a look at the new Foxhound and White Dragon’s interesting method of producing resin vehicles. Rather than traditional single piece vehicles (which are big chunks of resin), they are instead casting them in two parts. This means they can do larger vehicles without needing piles of material and also means they can hide. Personlly, I’m not a fan of the scale White Dragon has chosen for it’s releases (1/56 rather than 1/50) but I am looking forward to seeing the Mastiff when it arrives. 4Ground had their usual collections of small boards (including one for their Adeptus Titanicus range). Similarly, TT Combat were there in full effect, with the traditional mile of MDF boards all ready for people to buy. Of course, one of the big reasons to go to Salute are the demo games. This year there was a really nice selection of tables showing off different games, everything from the giant set piece games to some really nice and practical arrangements. First up, we have the Too Fat Lardies and their excellent Malaya set Chain of Command game. The game was busy all day and honestly, I just really enjoyed how good it looked! If you want some more details, Rich has been detailing the progress on it over on the Too Fat Lardies blog. Oshiro had a very evocative game set in Victorian London using their terrain. It’s not something I play but it definitely grabbed my eye. Burrows and Badgers is a guilty pleasure of mine and I always love the little boards these skirmish games provide. Gringo 40’s ran an Indochina game that literally stopped me in my tracks. From the way the river shines to the intricate buildings, every part of this screamed care and passion. Honestly, I’m not a fan of Battlefront’s offerings in terms of gameplay. But this board using Fate of the Nation was so impressive that I had to grab some snaps. No idea how well it actually played but it certain looked fantastic! Wargames Illustrated had a game using their brand new release in the Giants in Miniatures range, T.E. Lawrence on his bike. Simple but evocative board using the 4Ground buildings was a pretty good setup for an effective game. Peterbrough Wargames brought their Bloody Omaha game using I Ain’t Been Shot Mum and I love it, especially after reading Mike Whitaker’s blog where he documents putting it together. Giving the players the attacking Americans while the GM ran the Germans meant it was busy all day! A really cool WW2 game I glimpsed as I ran. Seemingly simple, but very eye catching. A very impressive looking fantasy game that was busy every time I went past it but I completely failed to write down which game it was! I’m going to admit, I’m not 100% what this game was but I think it was the Ardhammer 2nd Sino-Japanese War game. Honestly, it was mostly the paddy fields that grabbed my attention as I walked by and I just had to grab a picture. As traditional, Dalauppror was there with their impressive board. This year was the battle of Dänholm. Even though it’s not a period I’m a fan of, it was definitely a sight to behold. On the face of it very simple but very impressively done. Of course, my highlight had to be this. Walking the hall, my eyes were soon drawn to the familiar tan and roadways of Afghanistan. Moving closer, I was even more surprised to see British troops running around the classic scene, crossing over the canal and moving towards the compounds. This game, Operation Panther’s Claw, was being run by the Whitehall Warriors and to my surprise were using Skirmish Sangin! They explained a few tweaks they had made to make it play more easily with full fire teams but honestly I just love how the board looks! A sight any Modern wargamer would be jealous of – a true vehicle pool just waiting for the British to roll onto the board. I was really impressed with the sheer variety of figures on the board – every manufacturer I could think of was represented ranging from Spectre to Empress to Eureka to the Assault group. While talking to the guys behind this game, they showed off the level of detail they had been working to get. Each of the civilian vehicles actually have accurate number plates for the type of vehicle, with a mix of Pakistani and Afghan registrations to really set the scene. I really like this little detail, even if very few people would actually recognise it. Overall, I really enjoy coming down to Salute. Although mostly for the social side (catching up with friends mostly seen via Facebook), it’s also really nice to get that burst of hobby inspiration. So expect to see me back next year, all ready for more!